These events led to Louis' call for a new crusade in 1267, although there was little support this time; Jean de Joinville, the chronicler who accompanied Louis on the Seventh Crusade, refused to go. Louis was soon convinced by his brother Charles of Anjou to attack Tunis first, which would give them a strong base for attacking Egypt, the focus of Louis' previous crusade as well as the Fifth Crusade before him, both of which had been defeated there. Charles, as King of Sicily, also had his own interests in this area of the Mediterranean. The Khalif of Tunis, Muhammad I al-Mustansir, also had connections with Christian Spain and was considered a good candidate for conversion. In 1270 Louis landed on the African coast in July, a very unfavourable season for landing. Much of the army became sick due to poor drinking water, his Damietta born son John Sorrow died on August 3 and on August 25 Louis himself died from a "flux in the stomach", one day after the arrival of Charles. His dying word was "Jerusalem." 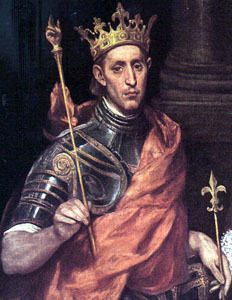 Charles proclaimed Louis' son Philip III the new king, but due to his youth Charles became the actual leader of the crusade. 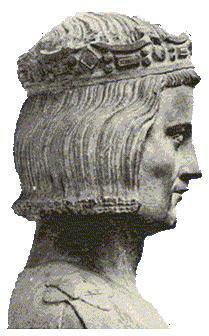 During his second crusade, Louis died at Tunis, August 25, 1270, and was succeeded by his son, Philip III. Louis was traditionally believed to have died from bubonic plague but the cause is thought by modern scholars to have been dysentery. The Bubonic Plague did not strike Europe until 1348, so the likelihood of him contracting and ultimately dying from the Bubonic Plague was very slim. Christian tradition states that some of his entrails were buried directly on the spot in Tunisia, where a Tomb of Saint-Louis can still be visited today, whereas other parts of his entrails were sealed in an urn and placed in the Basilica of Monreale, Palermo, where they still remain. His corpse was taken, after a short stay at the Basilica of Saint Dominic in Bologna, to the French royal necropolis at Saint-Denis, resting in Lyon on the way. His tomb at Saint-Denis was a magnificent gilt brass monument designed in the late 14th century. It was melted down during the French Wars of Religion, at which time the body of the king disappeared. Only one finger was rescued and is kept at Saint-Denis.